Hello Samosa House El Segundo! Stepping into the newly opened Samosa House in Plaza El Segundo, I was already quite mesmerized. The floor is adorned with colorful Indian designs and the place was popping with upbeat Bollywood music. There’s a wonderful aroma of spices from the array of hot Indian food on display. I knew that I was in for a treat at this newly opened place. Samosa House in El Segundo is the newest branch of a family owned and operated Indian restaurant specializing in Vegetarian and Vegan dishes. Their first restaurant was Bharat Bazaar in Culver City and they’ve since branched out to restaurants in LA, Santa Monica and now El Segundo. It was hard to choose from their various savory dishes but there was one dish I knew for sure I didn’t want to miss and that was their famous samosas. Samosa House’s samosas were once featured on Food Network’s “The Best Thing I Ever Ate” and it is not surprising. This was a great start of a meal here. It was crispy pastry filled with mashed potatoes and peas. It was served with tamarind and mint sauces. I loved the crispy edges and the savory ingredients. After the savory samosa starter, it was time for my main entree! I got a three item combo with charcoal smoked cauliflower, matar paneer and veggie chicken. The charcoal smoked cauliflower had crispy cauliflower in a creamy sauce. I loved the flavor of the cauliflower. The cauliflower is really distinct because of how it is prepped. It is first marinated and afterwards smoked with a charcoal pot. The veggie chicken was wonderful as well. The gluten nuggets were so tender. I also was such a fan of the butter sauce in this dish. The matar paneer was my favorite. This dish was packed with flavors! It had big chunks of paneer in a tomato based sauce. I loved it over the white rice. Aside from the white rice, the combo plate comes naan and raita or vegan soup. I chose to get garlic naan and had the pleasant surprise of receiving a very large piece of fresh-baked naan. Piping hot and fresh out of the oven, it was wonderful. The garlic flavor simply oozed out of the fresh bread. Last but not least, I tried Samosa House’s ginger chai. The Indian tea flavored with ginger and spices was so comforting on this somewhat overcast day. It’s slight hint of ginger was just right. I truly enjoyed every single item I tried here at Samosa House El Segundo. From start to finish, I was a fan. 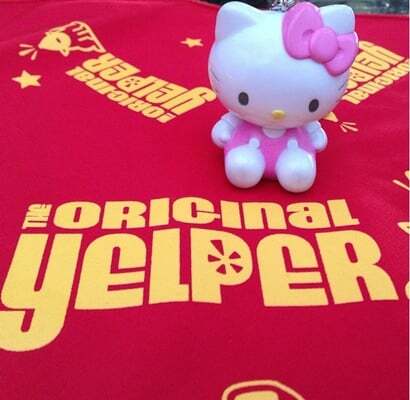 From their famous samosas to their savory dishes and their comforting ginger chai tea; this Hello Kitty Foodie was full of smiles. For more smiles, please see my Yelp review on Samosa House El Segundo. Hello Kitty ♥ Afters Ice Cream!